Get ready. Below you will find the most self indulgent post ever. You see I cut these white peonies from my neighbor's peony bush. And I couldn't decide which picture to use. 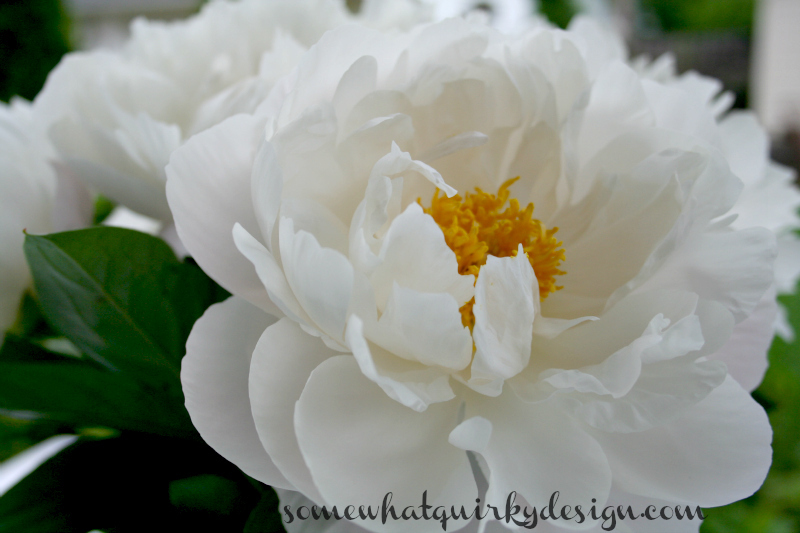 He has this peony bush right next to my driveway. I don't think he even knows that it blooms. I try to leave a few for him. I sure wish peonies stayed nice just a little bit longer. Actually, I wish they stayed nice for a LOT longer. 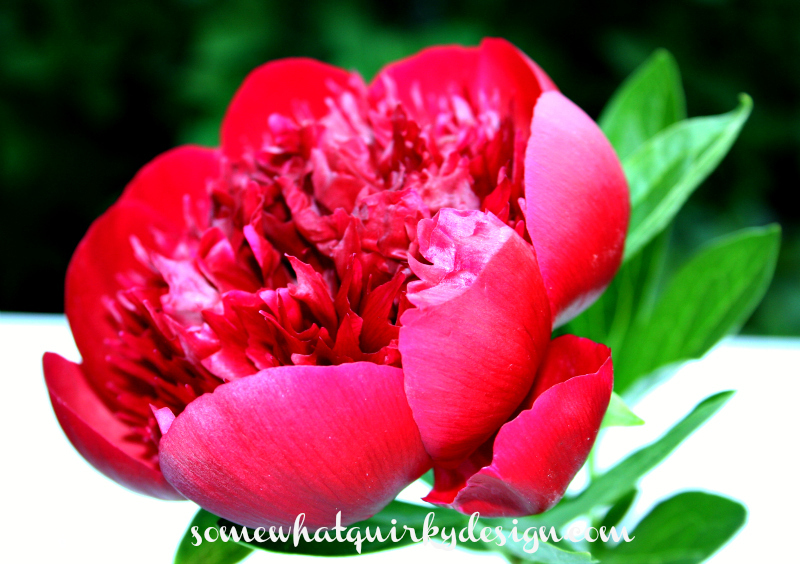 This scarlet peony was hidden away in the overgrowth just off the porch at an estate sale I went to last Friday. I stole it, too. It could be my favorite. I'm not sure I got the color right in the editing. It doesn't seem rich enough. I wish I had the nerve to sneak over there and get some root divisions from this bush. Seems like the bush was as tall as I am. Maybe I could just hide in the greenery while I dig. Thanks for indulging me! And for not turning me in to the garden police. Oh my, you're a flower thief!! 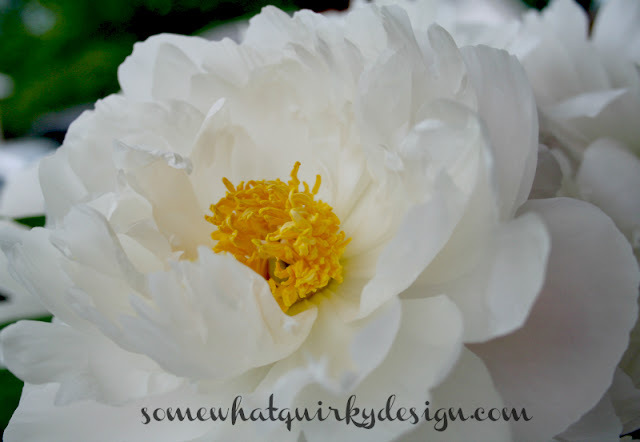 I have often wondered why peonies don't stay around a little longer. They are so gorgeous. (Obviously pretty enough to lead to a life of crime.) 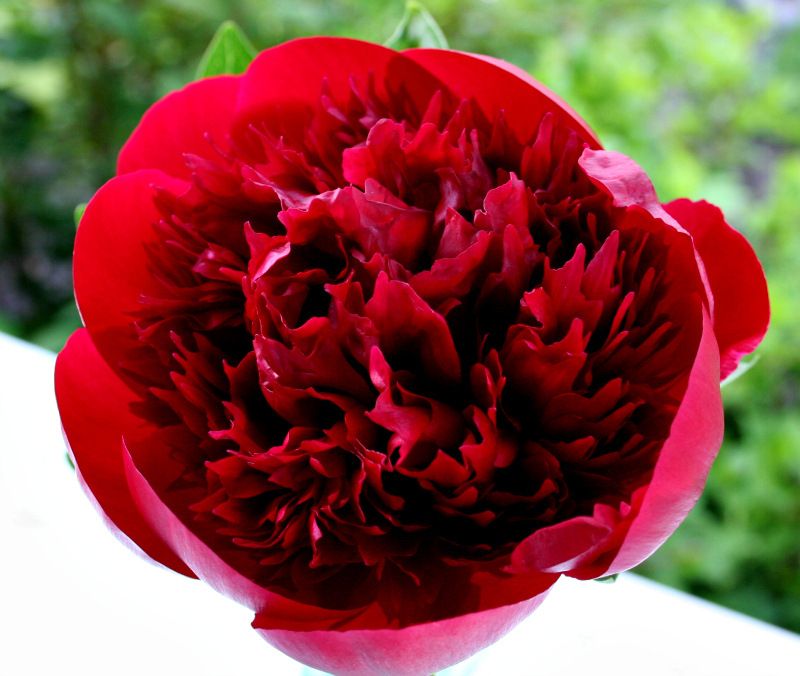 I bought a peony that was supposed to be blood red. It bloomed white last year, but dark pink this year. I'm hoping it will keep getting darker. Guess I'd better keep an eye on my flowers when you pass through here! I'm calling the po po unless you get me some, too. I want white ones. 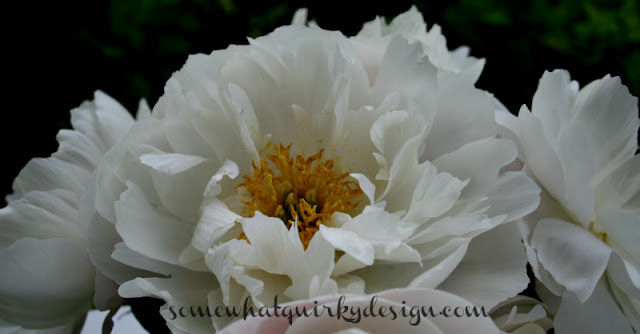 So get over there and engage in more flower folly! This post was drool worthy. Oh how I love peonies. I love them both so don't ask me to decide which one I like best. I would be cutting these all the time. I bet he won't even miss them especially if they are on your side of the driveway. Soon a garden gnome named Officer Murphey will be knocking on your door. I'm not sure any fellow bloggers are going to turn you in, but you have just provided graphic evidence of your crime !! They are gorgeous though - who could resist ! They are beautiful! Don't you just love neighbors who don't pay attention?! Hhaha! Thanks for sharing your find with us at Tips & Tricks! I bet they know...now do the right thing ..go tell them how lovely you think their flowers are. Then they will offer you to take a cutting for rooting your very own. If they don't then .. well! that wouldn't be normal. Wow Karen! They re beautiful! 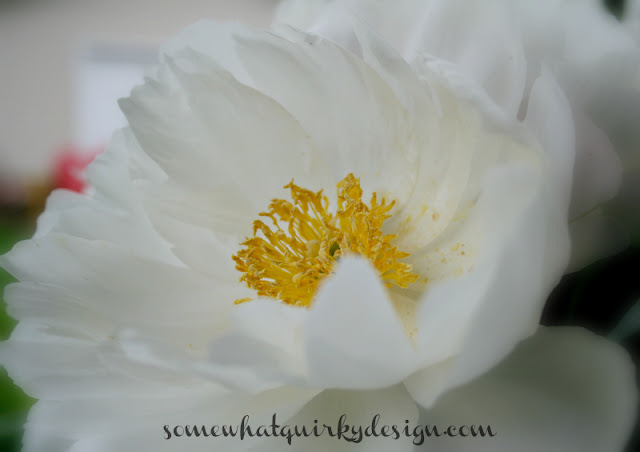 There is nothing like fresh flowers! 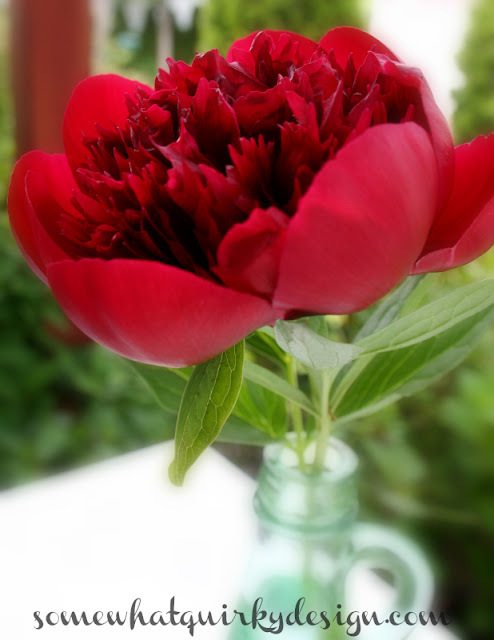 Your stolen peonies are wonderful. 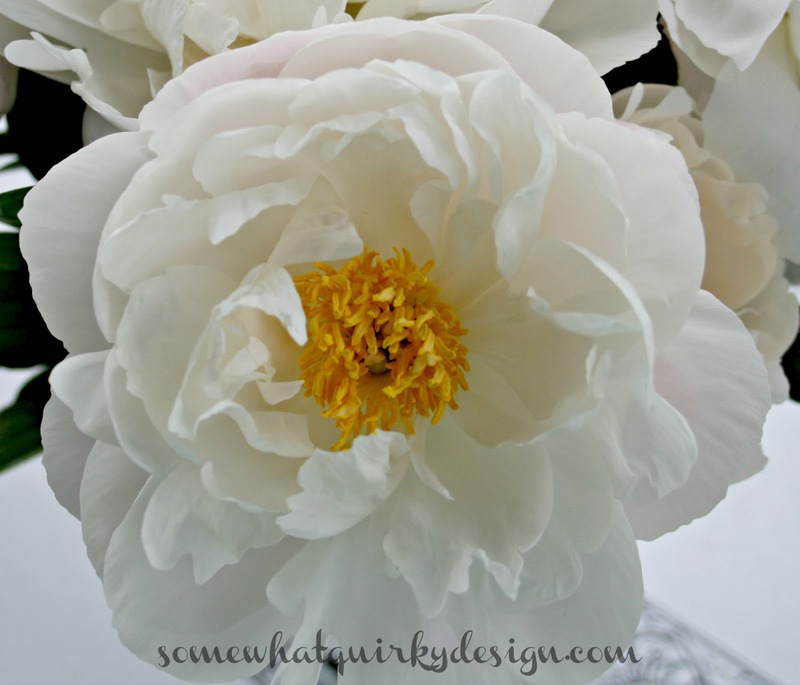 I don't know anyone who has peonies in their yard so they must not grow well in my climate. Oh, that pink peony is gorgeous! Go get yourself some of those root divisions. Walk right up like you know what you're doing (when nobody is at the house) and get busy digging. 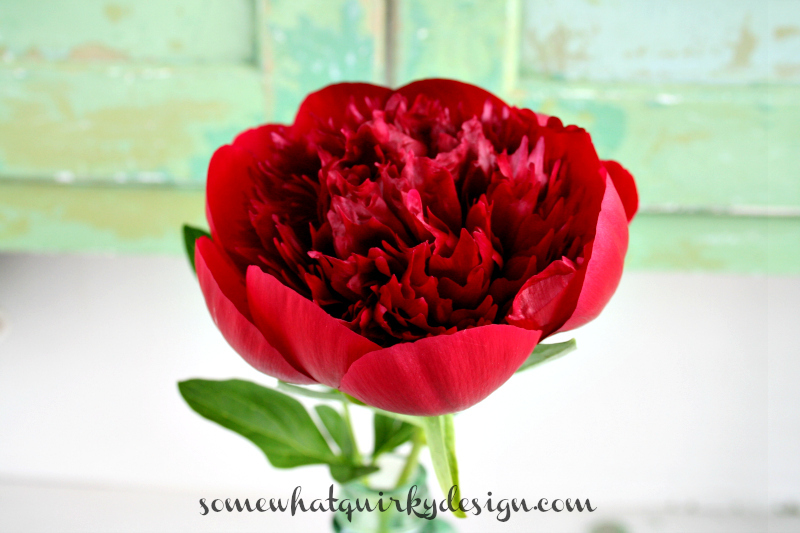 Love peonies too!